Yes, that’s right it’s called the Masretta MXT, and it’s a new mid-engine/rear-drive two-seater sports coupe with loads to offer the track day enthusiast. If you are thinking it looks a lot like a Lotus Elise that’s not by accident because its shares the same lightweight fun theme. And it’s from Mexico, home to many of the World’s manufacturers’ facilities but not necessarily the home of a national auto product. Designed and built entirely in Mexico, the Masretta MXT is Mexico’s first national car and has become a very cool story in itself. Designed as a driver’s car, development primarily focused on optimizing acceleration, cornering and braking capabilities. While under the hood, the Masretta MXT has a turbocharged, Ford Duratec 2.0-liter, four-cylinder engine that produces 250 HP and 250 lb ft. of torque. By using aluminum in the chassis and carbon fiber in the body, the MXT’s overall weight is only 2050 lbs creating a solid overall horsepower to weight ratio. As a result, it’s not only nimble but quick with acceleration numbers of 0-100 Km/h in 4.9 seconds and a top speed of 260 Km/h. Along with reasonable sticker price of only $60,000 USD, the MXT has some great upside for the enthusiast community since it’s very good value overall for a premium level sports car. But don’t go getting too excited about picking up one of these cheap in a few years since sales estimates are only around 200 cars per year. Personally, I’m still not 100% sold on the looks as I just can’t get beyond the thought of the bad marriage between a Toyota MR2 and Lotus Elise. Nevertheless, our job as journalists is to give the facts and be balanced so you can act as the judge at the end of the day. This is a great video of the Masretta MXT in its natural environment on the racetrack. As well, the boys from the UK’s Top Gear did a video feature on the MXT which provides some additional insights into the one and only 100% Mexican sports car. 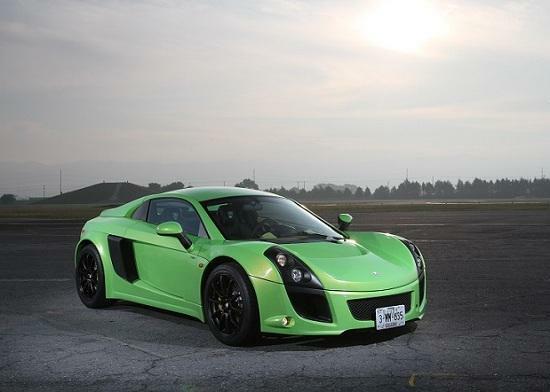 This entry was posted in News, Review and tagged Lotus Elise, Masretta, Masretta MXT, Mexico, Top Gear, Toyota MR2 by northredline. Bookmark the permalink.